A new NASA website shows just how the agency's Earth observation data helps communities across the United States deal with climate change, disasters and environmental challenges. Here's a run-through of the trailblazing women who achieved major firsts in space. At 3 p.m. EDT (1900 GMT) today, NASA will air a special episode of its NASA Science Live program to showcase our amazing planet Earth. 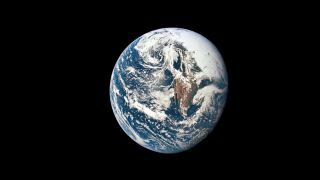 Earth Day 2019: These Amazing NASA Images Show Earth from Above Celebrate Earth Day with photos of our planet's natural beauty. SpaceX Crew Dragon Accident May Impact NASA Plans to Launch Astronauts from US Soil SpaceX and NASA need to know what went wrong. Lyrid Meteor Shower 2019 Peaks Overnight Tonight and Monday! Look for bright meteors in the early hours. The first findings from the ExoMars orbiter show no signs of methane in Mars' atmosphere. 'Alien' lights in Norway were a NASA mission, not an extraterrestrial visit. NASA's newest planet-hunting mission just got a list of high-priority targets. With a pivot to TV projects.